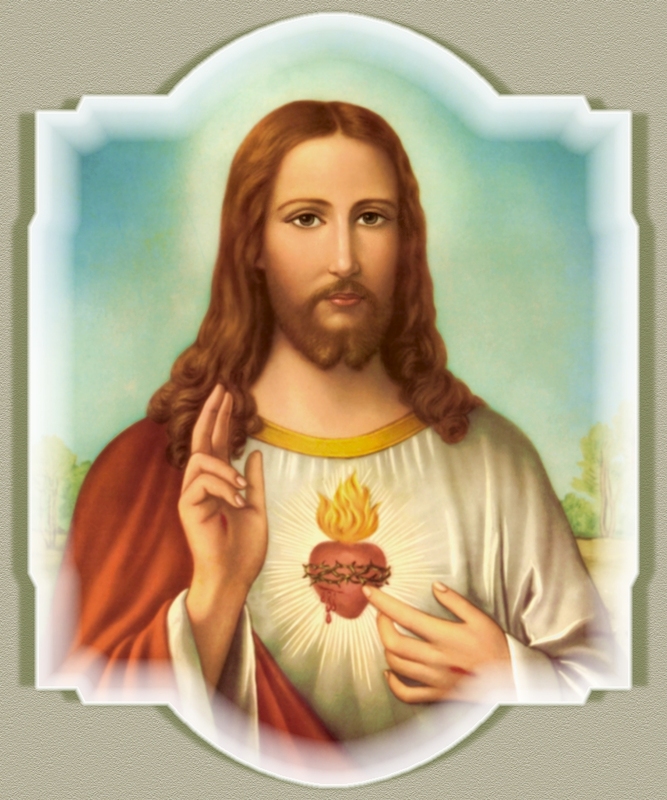 Excerpts from the complete edition of The Devotion to the Sacred Heart of Jesus by Father Croiset, S.J., are presented here at Catholic Tradition for the first time. This book was composed during the lifetime of St. Margaret Mary Alacoque and published in 1691, the year after her death. The letters of St. Margaret Mary show that the book was written at the request of Our Savior Himself, conveyed to Father Croiset by St. Margaret Mary; in her letter to him asking him to compose this book she assured him on the part of Our Savior that he was to get special assistance, and when the work was near completion she told him that it was so completely in accordance with the wishes of Our Lord that it would never be necessary to make any change in it. The book, then, rests on the authority of Our Lord Himself; as He promised, no change in it was ever found necessary-----even now, after the lapse of two and a half centuries during-----which time innumerable books on the devotion have appeared, it still remains the most practical book on the devotion to the Sacred Heart. The book remained only thirteen years in circulation, during which time it was translated into nearly all the European languages. At that time the Catholic religion was being persecuted in England; Blessed Claude de la Colombiere, who had introduced the devotion to the Sacred Heart there, was first imprisoned and afterwards banished from England, so no translation of Father Croiset's book was made into English. Since the book was restored to circulation at the end of the last century, a very much abridged edition has appeared in English, in which the space available did not permit the inclusion of many important chapters. "If you knew the ardent desire which urges me to make the Sacred Heart of my Sovereign known and glorified, you would not refuse to undertake this work. If I am not mistaken, He wishes you to do so." And on September 15 of the same year she wrote to him: "Since you wish me to tell you what I think about your plans for honoring the Divine Heart of Jesus, I believe [if I am not mistaken] that they are most pleasing to Him . . . And I tell you that you are happy to be among the number of those whom He will employ for the execution of His designs, as I can have no doubt but that He has chosen you for this work; follow the lights which He will give you for the execution of it. With regard to all that you propose to me in your letter both about meditations and the indulgences, it seems to me that I see clearly, and in a way which leaves no doubt, that it is He who has inspired you in this manner with these ideas. He has given me to understand that this manner is so pleasing to Him, that none other but Himself could have arranged everything so much to His wishes, and I believe that He will be very much glorified by it." When she was aware that Father Croiset had undertaken the work she said to one of the sisters in confidence: "I shall certainly die this year in order not to be an obstacle to the great fruits which my Savior intends to draw from a book on devotion to His Sacred Heart which Father X. will get printed as soon as possible." In two letters during the last year of her life, while assuring Father Croiset again of special Divine assistance for his work, she warned him of how much he would have to suffer on account of the publication of his book. On January 17, 1690, she wrote to him: "If I am not mistaken, our amiable Savior seems to promise me that He will furnish you with all the graces and helps necessary, and even that He will supply on His part for all that may be wanting on ours. But all that will not be accomplished without much pain and suffering, which you are to receive as the strongest proofs of His will." On August 21 of the same year, she wrote to him: "You are surprised at that [some trial he had to endure], but that is nothing; more is to come, for you must be purified like gold in the crucible for the execution of the designs of God. Those designs are truly great; therefore you will have much to suffer from the devil, from creatures and from yourself. But what will appear to you hardest to bear, will be when God will seem to take a share in making you suffer, but you have nothing to fear, for this is the way to show that He loves you . . .
"But to return to the question of your work on the adorable Heart of my Jesus, I have no doubt that He has assisted you, since the whole work, if I be not mistaken, is so perfectly in accordance with His wishes, that I do not think that it will be necessary to change anything in it . . . Once again I pray you not to be downcast on account of all the contradictions, troubles and obstacles which this work which you have undertaken will encounter. Consider that He for Whom you are doing it, being all-powerful, will not allow you to lack any of the helps necessary to accomplish it perfectly according to His desire." Everything happened as St. Margaret Mary had foretold: she died before the end of the year; her death removed an obstacle to speaking freely about the revelations which she had received, and permitted Father Croiset to include an account of her life and the favors which she had received; the book was published as soon as possible during the year after her death; God was very much glorified by it, for in a short time it was the means of spreading devotion to the Sacred Heart to the ends of the earth; and finally it was a cause of great trouble and suffering to Father Croiset himself, for after being translated into most of the continental languages and enjoying an immense circulation for thirteen years, it was put on the Index by a Decree of the Congregation of the Index of March 11, 1704, because the author, though in good faith, had omitted certain formalities required for a book dealing with such an important subject. During these thirteen years, other books on the devotion appeared; among these was a book by Father Galliflet, who had been a novice under Blessed Claude de la Colombiere. Other works continued to appear in various languages by distinguished authors; in the course of time several papal encyclicals explaining and advocating the devotion were issued, and Father Croiset's book became forgotten for the space of nearly two hundred years. However, when Divine Providence deemed the time opportune, the book was restored to circulation by the same Congregation that had ordered it to be withdrawn. The letters of St. Margaret Mary make it clear that the book was completely in accordance with the wishes of Our Divine Savior and was published according to His desires, and that the withdrawal from circulation was foretold and permitted for His own wise purposes: we are, therefore, justified in concluding that the reappearance of this book by the permission of the Church in modern times is also providential, and that reappearing at a time when Our Savior has issued a new appeal from His Sacred Heart to a world that is turning away from God, it is given to the Church to aid in restoring the devotion to the Sacred Heart of Jesus to its original fervor. The following are the circumstances under which this book made its reappearance: when the hierarchy was reestablished in the former Turkish provinces of Bosnia and Hertzegovinia, Monsignor Stadler, Professor of Theology at the University of Agram, was appointed to be the first Archbishop of Sarajevo. Immediately after his appointment, he announced his intention of consecrating his archdiocese to the Sacred Heart of Jesus, and of putting all his trust in the Sacred Heart to reestablish the Catholic religion in these provinces. No book on devotion to the Sacred Heart existed in the language of his archdiocese. He selected Father Croiset's book as what he considered to be the most suitable book to explain the theory and practice of this devotion to the priests and laity of his diocese; he translated it, had his translation printed and was about to circulate it when he was informed that this book was on the Index. He wrote to the Sacred Congregation of the Index asking for permission to publish his translation. When the Sacred Congregation suggested to him that he should select some other of the numerous books on this devotion, he replied that he could find none other so suitable for his purpose, and requested the Congregation to have the book examined and to make any changes deemed necessary. The Sacred Congregation acceded to his request, and had the book submitted to a rigorous examination in the light of the papal encyclicals and decrees of the two centuries that had elapsed since the book had been written. The result of this examination was that no error whatever could be found in the book and no change necessary; the book was removed from the Index, and permission given to publish it in all the languages of the world, as the author had written it. Thus was fulfilled the prophecy of St. Margaret Mary Alacoque that no change would have to be made in Father Croiset's book, as it was perfectly in accordance with the wishes of Our Lord. In recent years Our Savior appeared to another member of the Visitation Order, Mother Louise Margaret, with a new message from His Sacred Heart for His priests to be conveyed by them to the world. The message is, in brief, that He wishes His bishops and priests to unite in a new association for the purpose of promoting devotion to His Sacred Heart. The Holy See, while not pronouncing on the supernatural origin of this message of Mother Louise Margaret, has sanctioned the establishment of the Priests' Universal Union and three allied societies for religious and laity of both sexes for the purpose of promoting devotion to the Sacred Heart as Mother Louise Margaret had asked. Mother Louise Margaret in The Book of Infinite Love urges the clergy not to be content with a mere superficial knowledge of this great devotion, but to make a deep study of it so as to be able to explain it to the faithful who do not all yet understand the treasures of grace and regeneration which are found in the Sacred Heart of Jesus. To help towards acquiring a knowledge of both the theory and the practice of this devotion, what book could be more suitable than the one which was written at the command of Our Lord Himself, under the direction of His chosen apostle of the devotion, St. Margaret Mary, by her director, Father Croiset, specially selected and assisted for the accomplishment of this work! Father Croiset states in his preface that the essence of the devotion to the Sacred Heart consists in the perfect love of Jesus Christ, especially in the adorable Sacrament of the Eucharist, and that this perfect love of Jesus Christ forms the subject matter of this book. It is evident, then, that this book, while intended for all who wish to acquire true devotion to the Sacred Heart, is specially suitable for priests and religious. For the convenience of those who wish to use the meditations and prayers, we have placed them in this sub-directory, rather than in the main Christ the King index. The prayers written by St. Margaret Mary are a manual of the devotion to the Sacred Heart, suitable for visits to the Blessed Sacrament and for the Holy Hour. We have included many of them in this excerpted version. May our adorable Savior deign to bless this humble effort to make His Sacred Heart more widely known and honored, and more perfectly loved!